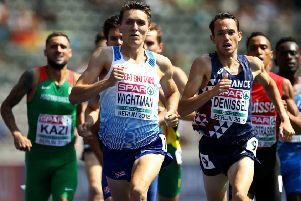 Jake Wightman admits he doesn’t want to be left trailing by a new generation at the European Athletics Championships in Berlin, even though he’s only just turned 24. The Edinburgh AC hope opens his bid in the heats of the 1500 metres in the German capital today along side Edinburgh club-mate Chris O’Hare, with the motivation of banishing the memories of two years ago in Amsterdam when he led off the final bend before slumping to seventh. And with all the pre-event hype focusing on 17-year-old Norwegian wonderkid Jakob Ingebrigtsen and his elder brothers Filip and Henrik, Wightman is eager to underline he is still a coming man in the sport. “Even in Britain, at 24 I’m one of the older ones making finals,” he said. “The sport moves on. You never know what can happen. So you need to make the most of now. But I still think that within my racing career, I’m nearer the start than the finish. Lynsey Sharp goes into tonight’s 800m semi-finals after qualifying with ease from yesterday’s heats in second place in a time of 2:00.32. With her fitness proven at just the right time, the 2012 champion admitted she was coasting rather than pushing at full speed. Elsewhere, Pitreavie’s Eilidh Doyle opens up in the semi-finals of the 400 metres hurdles later after being given a free pass through the heats to join fellow Scot Kirsten McAslan, who advanced in second place.